FABRICA has launched City Wharf, a collection of 327 stylish, canalside apartments comprising one, two and three bedrooms on Wharf Road, N1, an extension of the Regent’s Canal. The scheme is reviving this former industrial setting and enhancing the area’s status as one of the capital’s newest residential destinations. Located on Wharf Road, next to the Wenlock Basin, an extension of the Regent’s Canal, City Wharf will offer residents the tranquillity of a waterside setting and is also close to the trendy boutiques, theatres, pop up bars and café culture of Islington. Referencing Wenlock Basin’s industrial history which dates back to the 1820s, City Wharf has been designed by Stephen Marshall Architects in a striking, warehouse style that articulates the area’s past as a thriving centre for timber production and transportation. Arranged across four buildings of varying heights, the one, two and three-bedroom apartments and penthouses at City Wharf enjoy high specification interiors that have taken inspiration from the area’s industrial heritage. The open plan living areas have floor-to-ceiling glazing, which flood the interiors with natural light, while flexible floorplans create an adaptable living space. Bedrooms are equipped with full height, built-in wardrobes with soft closing doors and internal LED feature lighting. Each kitchen includes a wine fridge as standard, stone worktops and integrated Siemens appliances. Additional features include underfloor heating, video door entry as well as a 24-hour onsite concierge service. 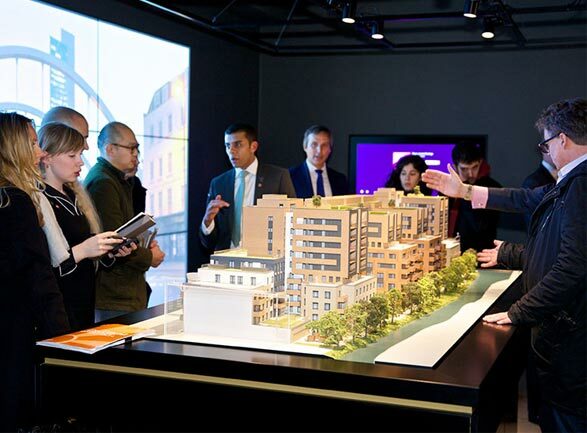 Residents at City Wharf will enjoy the development’s panoramic canal and city views from their private balconies, one of four roof terraces and canalside landscaped courtyard gardens. The scheme includes storage for over 300 bikes and underground parking is also available to some apartments. Rosie Nesbitt, Group Sales & Marketing Director, FABRICA, said: “The unique combination of canalside living, great transport links and an array of leisure opportunities in the immediate vicinity makes City Wharf a great investment for local purchasers and investors. Situated off City Road yet adjacent to the tranquil setting of the Wenlock Basin, City Wharf’s location offers a real point of difference. The canal provides the perfect setting for leisurely walks, jogs or cycles alongside the Regent Canal’s historic towpaths and walkways. The Parasol and Victoria Miro galleries are located next door for art enthusiasts, while Sadler’s Wells is a mecca for dance productions, and the Almeida Theatre in Islington is a cultural landmark. Jamie Oliver’s Fifteen put City Road on the map as a culinary destination when it launched in 2002, while Shoreditch House, Hawksmoor, The Boundary and Gavin La Chapelle all offer some of the finest dining experiences in the capital. The Wenlock Arms and The Eagle cater for pub aficionados while the Nightjar highlights the local resurgence of speakeasies. Ideally located within walking distance of London’s financial centre and business districts, City Wharf is the ultimate location for city professionals. Coupled with its close proximity to Angel and Old Street Underground Stations, commuters are well served for transport links across the capital. The arrival of a direct link from nearby Farringdon to Heathrow Airport in 2018 will also simplify access to the major flight routes out of London.